Our two sites in upstate New York are residential academic treatment centers. 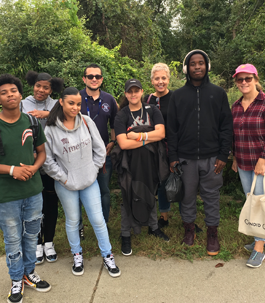 Services: At Dynamite Youth Center (DYC), we work to help dependent adolescents and young adults create positive change in their lives through comprehensive counseling. Since 1970, we have specialized in drug-free counseling to rehabilitate drug dependent adolescents and young adults through education programs, advocacy, community services, and family involvement. An important element of our model is our educational program. DYC participants who do not have a high school diploma enroll in our on-site ReStart school program. We offer a full-time educational program in which students can pursue a high school or high school equivalency diploma. Our school program is staffed by two full-time ReStart teachers, a full-time community associate, and a part-time guidance counselor. Our educational program offers small classes and highly individualized instruction to help each student meet his/her diploma requirements. DYC is a long-term program. All participants begin at our residential facility in upstate Fallsburg, New York. Upon successful completion, participants transfer to our facility in Brooklyn. Admission Process: Please call our intake director for information about admissions. Services: ReStart Academy offers our clients quality education in the form of HSE classes, referrals for continuing education, and resources upon their completion. We place clients in the appropriate grade level classes and move them from ABE to pre-HSE and finally to HSE as their scores progress. Our teachers are seasoned professionals who provide one-on-one tutoring when needed but who can easily adapt to our fluctuating population and their needs. The Ellenville campus at Samaritan Daytop Village has some of the best success rates in the state, and we are proud of our partnership with them. Admission Process: Samaritan Daytop Village assessment units, located in both Queens and upstate, make client referrals. ReStart sites takes referrals from our population only. We administer the TABE exam, which determines starting grade levels, to clients who do not have an HSE and wish to attend the ReStart program. Documentation Required: In order to be placed in the ReStart Academy, clients must have TABE scores.